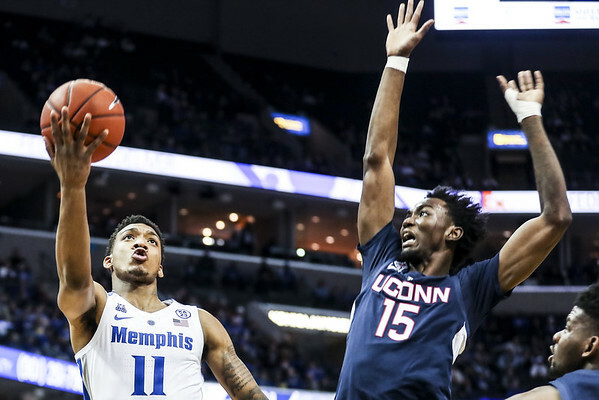 MEMPHIS, Tenn. - Memphis coach Penny Hardaway has wanted to spread the offensive load around to other players in recent games. Kyvon Davenport took the challenge, having his best game in weeks. “Everything is set up for him to go out and do that. He just has to produce,” Hardaway said when asked how to keep the 6-foot-8 Davenport engaged. The Memphis coach added that the Tigers offense is set up to get Davenport the ball in areas where he is comfortable. Playing without Adams, the Huskies got a career-high performance from Polley, a sophomore, who was 7 of 12 from the field with four 3-pointers. Only seven Huskies played and 40 percent shooting, along with 18 turnovers, were not enough to overcome the big leads Memphis built. UConn entertains No. 25 Houston on Thursday.